When you're going to burn a file straight to a CD, it makes sense to be able to insert one into your optical drive and have it copy files by launching its own copying software. That's the thinking behind Orlogix's AutoMagic CD-R, which features autorun CD burning software and CD-R in one disc. That's right, AutoMagic launches software and then copies data over itself. It's a novel idea, but with powerful burning software available for just £20, why should you choose this route to back up your data? The humble CD-R has been pushed into the shadows by the ubiquitous USB stick, but Orlogix is making a decent stab at reviving it as a viable storage media. AutoMagic covers the same ground as USB, but if you're trying to copy something from a PC without a spare USB connection, AutoMagic is a speedy way of getting those files backed up without having to go to the trouble of finding a program to burn with. AutoMagic CD-R can burn photos from your PC or directly from your digital camera. Music compilations, text documents and videos can be burnt, too. 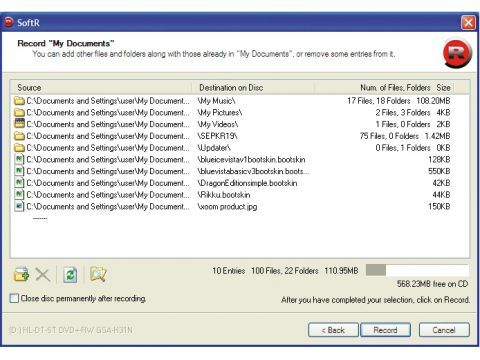 What we liked most was the speed of copying, which matched the best in dedicated burning software, such as Nero or Roxio. While AutoMagic CD-R performs well with its friendly wizard and speedy copying, it loses points by being severely restrictive in its use. If you want to burn an audio disc, forget it. You can only burn the files as recordable versions and not audio. There's also a limited range of file types that can used. CD-to-CD copying is unavailable, which means that you can't make much use of two drives if you have them. In most cases, then, AutoMagic can't replace USB or traditional disc burning, but it can be handy to have a few of these discs stashed away in your drawer. Even more so when you consider that the starter pack is available for just £15, which includes 15 discs and a CD-labelling pen.